You’re likely to get two to four colds a year, according to Johns Hopkins Medicine, while your child may succumb to twice that many. There’s no cure for a cold, so prevention is your best bet. But once you’ve caught a cold, some foods may help you feel better or even shorten the time you feel sick. Smoothies can soothe your sore throat while delivering nutrients that support immunity. Even when you feel lousy, it’s easy to whip up a smoothie that will give your immune system a boost. You’ll want to start with 1/2 to 1 cup of your favorite liquid base and add that to the blender first. The next additions are up to you and your taste buds -- plain yogurt, fresh fruit, greens, nuts or nut butters, and flax seeds are all good options. 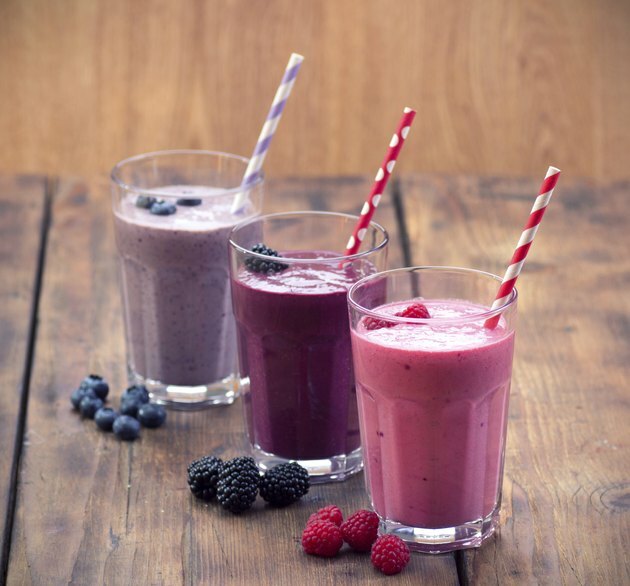 Thicken your smoothie with a handful of ice, which will also help cool your throat. Look to vitamin D foods when you’re choosing your liquid base. This nutrient has proven benefits for respiratory health. One study looked at 6,789 British participants born in 1958 and found that, at age 45, those with higher serum vitamin D levels experienced fewer respiratory infections and better lung function. The results were published in the British Journal of Nutrition in 2011. Sources of vitamin D for smoothies include cow’s milk, fortified plant milks and orange juice, and yogurt. Vitamin C is one of the best-known nutrients for the common cold. While this powerful antioxidant won’t prevent colds, it can help shorten their duration, says MedlinePlus. Most fruits offer some vitamin C, but those with the highest amounts are also deliciously smoothie-friendly. Possible smoothie fruits with more than 20 percent of your daily needs for vitamin C include blackberries, raspberries, strawberries, oranges, kiwi, guava, papaya, mango and pineapple. Toss in a generous handful, about a cup. Use frozen fruit to eliminate the need for ice cubes. Squeeze a little lemon juice into your smoothie to add a crisp flavor and even more vitamin C.
Green smoothies are all the rage, and for good reason -- adding leafy greens boosts the antioxidant content of your smoothies significantly, including those you use as cold remedies. Kale is an excellent smoothie choice, with more than 20 percent of the recommended vitamin C for adults. It’s also loaded with vitamin A, another powerful nutrient that boosts immunity. Choose baby kale leaves for a milder taste, and use a generous handful. For a taste of the tropics, blend up a cold remedy smoothie made with an equal mix of fortified orange juice and coconut milk, sliced mango or papaya and pineapple, and ice; some grated ginger gives it a kick and helps soothe your cough and sore throat. When you want the benefits of greens, make a smoothie with vitamin-D-fortified soy milk, baby kale, a banana, frozen blackberries or blueberries, and a tablespoon of flax seeds to help you power through your cold. Can One Green Smoothie a Day Make You Lose Weight?